Posted by davelawrence8 at 4:52 pm on December 28th, 2012. No comments... » Categories: apple, random. 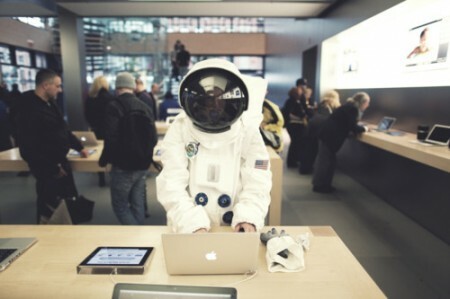 Tags: apple store, astronaut, retail. Subscribe via RSS. 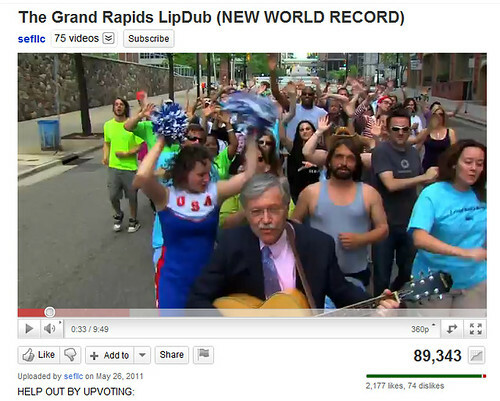 Nice to know Gruber is helping out Grand Rapids. Posted by davelawrence8 at 9:03 am on May 27th, 2011. No comments... » Categories: blogs, random. Tags: daring fireball, grand rapids, michigan, youtube. Subscribe via RSS. It’s a strange thing to try and wrangle the perfect prize for something you’re after on Amazon.com. With my new camera, I keep hearing that a prime lens is the way to go. Easy, no fuss, all about framing – stick on a prime lens, forget about zooming, and start taking pictures. For my needs, it’s hard to argue with Canon’s “nifty fifty” 50mm f/1.8 lens, the cheapest lens they offer at about $100. One hundred dollars is not a big deal. But is $125? Or $119? Depending on what time of day or day of the week you check the nifty fifty’s listing on Amazon, you could pay any one of those prices. My target price was $99, as seen above. This, combined with a gift card I received over Christmas, would put the 50mm in a very affordable range – especially for a rookie like me. Not more than a week later, the price jumps 20% to $120. So I check Canon’s own refurbished lens listings to see if I could save any money there. The 50mm is prices very competitely at $80, which – when you combine my Amazon.com gift card and the new, higher price – makes it an appealing option. Sure, the lense is refurbished, but lenses don’t wear out like cameras do. But by the time you figure in shipping, Canon’s refurbished price isn’t as much of a savings over the Amazon.com price. So I recheck Amazon’s listing. Items in your Shopping Cart will always reflect the most recent price displayed on the item’s product detail page. This price may differ from the price shown for the item when you first placed it in your cart. Placing an item in your cart doesn’t reserve the price shown at that time. It is also possible that an item’s price may decrease between the time you place it in your cart and the time you purchase it. But they offer little in the way of explaining these ghost prices. Finally, about a week ago, I watched the 50mm price rise and fall for an entire day until it hit $99 again, and then quickly hit the “Add to Cart” button. Might as well catch it while I can, I figured, and not be a slave to market conditions any more. But what are those marketing conditions? And what logic do they follow? Complicating things was this “grey market” model of the same lens, on sale for $108. What was this thing doing in the Amazon.com store? What is its function? The best I can put together, and from my past experiences with buying from Amazon (side note: I always use bloggers’ affiliate link, and I recommend that you do, too, to help out your favorite writers), it has something to do with Amazon.com using different suppliers from around the country. If one supplier runs out of, say, my 50mm lens, Amazon switches gears to another supplier who might charge a higher price. Retailers like Amazon have the legal right to set their own prices independently, but some manufacturers place restrictions on how those prices may be communicated. Because our price on this item is lower than the manufacturer’s “minimum advertised price,” the manufacturer does not allow us to show you our price until you take further action, such as placing the item in your shopping cart, or in some cases, proceeding to the final checkout stage. The steps required depend on the details of the manufacturer’s minimum advertised price policy. Taking these steps allows Amazon to show you our price consistent with our goal of always offering you the lowest possible prices on the widest selection of products. Right. So it’s all a shell game of sorts. For me, it’s standard practice to him and haw over an item for weeks before actually purchasing the thing. Somehow, looking at an item over and over again helps me make consumer decisions. But it’s because of this behavior that I noticed Amazon’s goofy pricing switcheroo. Knowing this, my neurosis is bound to get worse. If I’m never sure the price I’m paying is the lowest price possible, what sense can be applied to the world around me? It’s frightening in the deepest, most horrifyingly existential way. Perhaps the point, in the end, is that I got the lens at the lowest price, I was able to take advantage of the my Amazon gift card, and I’ve been very satisfied with the results. Posted by davelawrence8 at 10:04 pm on February 11th, 2011. No comments... » Categories: random. Tags: 50mm, amazon, amazon.com, f1.8, price, pricing. Subscribe via RSS. I first got a glimpse of how non-permanent (as Buddhists would say) the Web is while compiling my list of Newton-related sites. Maybe 40 percent of any Newton site are now dead and gone. It’s not just archival, dead-platform sites that suffer from 404-itis. Relatively modern blogs leave a trail of links that are, today, dead ends. For fun, I like to browse through John Gruber’s Daring Fireball Linked List archives, just to see what life was like in the Mac world before 2005, the year I switched. Most of the links back to Dan Benjamin’s Hivelogic blog are gone. And one, an explanation of FTP from Panic’s Steven Frank, is a non-starter. Searching for these posts is an exercise in futility. The only available option is archive.org’s Wayback Machine (where I finally found Frank’s post – love his old blog design). The Web’s hyperlinks are the key to its success and openness. You find stuff because other people find stuff, so you click a link to find what they found. But when what they found is gone, or missing, it’s frustrating. For blogs, the switch to a new platform can make all your links, maybe hundreds gathered over the years, non-functional. That’s what I imagined happened with Dan Benjamin’s Hivelogic. Or Steven Frank switching to Tumblr. I, too, switched to Tumblr for my personal site, leaving behind a Blogger-hosted weblog. All my old links are still available because the Blogger blog is still around, an abanonded building in a shoddy neighborhood. If there was an easy way to transfer all those blog posts to Tumblr, I would do it in a heartbeat. But still, if I shut down the old Blogger blog, all my old hyperlinks would become dead ends. WordPress makes it a little easier, with XML exports and domain name serving. I exported the WordPress.com-hosted Newton Poetry and imported it into the new, self-hosted version. A lot of my pictures were left behind, but the text and links work decently (Thomas Brand’s words still haunt me to this day). Now, if you write regularly, maybe you produce so much content that your old posts don’t matter as much. There’s plenty of new content to overwhelm the old stuff. But it seems to me, as a writer, that the old stuff – the really good stuff – is just as important and should be preserved in some form. For instance, I (foolishly) kept a Myspace blog and wrote a ton of material for a few years. But when I left Myspace and deleted my account, all that material disappeared. To prevent a total erasure of memory, I copied and pasted all of those posts into my Blogger site. Not like blog to blog, but post to post, individually. It was such a chore. But I felt that a lot of the material was too good to let go. What’s a real shame is that I had no choice but leave comments behind. There’s no easy way to take your written material with you when you make a switch. There are ways to do it, but usually they’re incomplete or, like my Myspace-to-Blogger example, a mind-numbing project. And it’s not just that words that are the problem. The missing or incorrect hyperlinks will still be out there in the ethernet ether somewhere, a collapsed barn in some weed-riddled field. If you don’t keep your domain name maintained, or stop paying your web hosting bill, kiss your links goodbye. This seems like the perfect project for Google, or for the Smithsonian. It would be a heckuva lot more useful that archiving Twitter. The problem would be the server space to host all those images, videos, text, and PDFs. But if anyone has the muscle to tackle a Web-wide archive, it’s Google. The Web is too democratic to be under a for-profit business’s lock and key, however. It needs to stay public, whatever – and however – that means. Posted by davelawrence8 at 6:14 am on June 3rd, 2010. 2 comments... » Categories: blogs, community, random. Tags: 404, HTML, hyperlinks, links, wayback machine, web. Subscribe via RSS. As an iPhone user, I’m lucky. My voicemail greeting does not burden a caller with an inanely-long “after the beep” message. I realize I’m one of the lucky few, however, because I face this message every time I call someone else. It has to stop. And not just because of the cost to consumers. I realize that AT&T needs to make money, and while I wag my finger in shame at using a tactic like the beep message, I understand. I work at a financial institution, and we’re all about using little things, here and there, to draw in more income. What’s annoying is that it wastes my time. And time, sir, is something I can’t get back. Like Mr. Pogue mentioned in his article, the basics of leaving a voicemail – which have been with us since the dawn of the answering machine – are known to everyone but the Amish and the corrupt. In fact, many voicemail greetings created by users include the words “you know what to do after the beep” or “leave a message after the beep.” Adding extra instructions without a user’s consent is time wasted. We’re not long for this Earth, Mr. Siegel. You, or me, or your communications professor from college could go at any time. We live in strange times, after all, and one never knows when the mortality clock could stop ticking. It could happen as I type this. Ever heard of ball lightning? Anyway, the point is – please let us users decide how much of our friends’ and family’s time to waste. What do you say? Instead of sitting and listening to a laughably-didactic woman tell me I can “page” (is this 1996?) the person on the other end, I just want to leave a message without being accosted by the recorded message. Right? PS: Fix your service. Half my apartment gets a mediocre reception, while the other half has none at all. Posted by davelawrence8 at 6:12 pm on July 30th, 2009. No comments... » Categories: ipod/iphone, random. 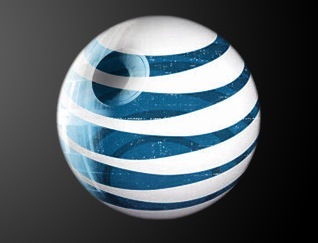 Tags: at&t, beep, cellphone, iphone, pogue, wireless. Subscribe via RSS. What you’re looking at is the high crest of some Mac appreciation wave that is only now breaking. I posted my Apple.com, circa 1983 picture on June 29 – three days after sharing it on Flickr. Since then, the image has been shared on numerous blogs (including one of my daily reads), and has spread around the world. It’s been an honor to see how this little project took off. To give you an idea, Newton Poetry typically earns anywhere from 300-700 hits on an average day. For those days that I publish something to Macsurfer, that number can reach into 1,000 or so. But that’s only happened a few times. Hitting 3,600 hits in a day, however, is unheard of for this blog. It’s madness. And it’s humbling. The funny thing is, I had a feeling it was coming. Something told me that drafting a snapshot of Apple’s make-believe 1983 web site, something I hadn’t seen anyone tackle before, would be something people could enjoy. But 43,000 views and 30 comments on Flickr (and counting) tells me it reached those Mac fans, like myself, that love the retro kitsch stuff. Here I thought the first day’s traffic, that little spike you see on the left, was big news. Then things creeped down back to normal, when Cult of Mac wrote about it and – BOOM – off it went. My biggest source of traffic has come from some German web sharing service Swedish blog network that I’ve never heard of. Amazing. Looking at it almost a month later, there’s some things that I would change about the mockup. For one, someone pointed out that I had the wrong Apple II at the bottom. I’d like to mess with the kerning a bit on the headlines. Also, some have suggested that I should have used Apple’s old serif font (what would become a modified version of Garamond) for the typeface. But I hate that typeface, and I wanted to keep things simple and more modern. Besides, the picture was thrown together on a Thursday night, the product of an idea and some Google Image searching, and is by no means an accurate representation. It only shows what one could do with Apple’s iconic web site design. Most of all, my little project has shown the power of the share-able web. After I posted the mockup and Twittered it, the thing spread immediately to blogs and re-Tweets, and started generating unheard-of levels of traffic to this site. So thanks to everyone who chimed in, shared the picture, and visited this site. I hope some of you will stick around, because I do love me some classic Macintosh, and Newton, and am willing to do more of this kind of thing. I have a Newton launch day version of Apple.com swimming in my head as I type. Posted by davelawrence8 at 5:45 am on July 21st, 2009. 5 comments... » Categories: community, humor, lowend, random. Tags: 1983, apple.com, flickr, lisa, newton, twitter. Subscribe via RSS. Imagine, if you will, an Apple Computer before the Macintosh, before the iPod, before the iPhone – shucks, before Steve Jobs was kicked out and brought back for Apple’s sprint to success. 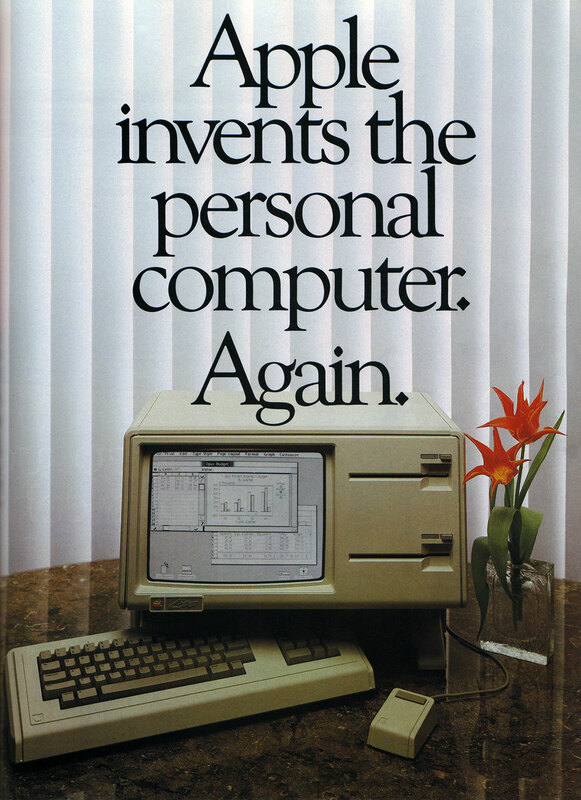 In any case, by 1983, Apple was in danger. Their competitors in the emerging PC industry had been joined by IBM. Purchasers who’d chosen Apple out of necessity were relieved to be able to turn now to Big Blue. 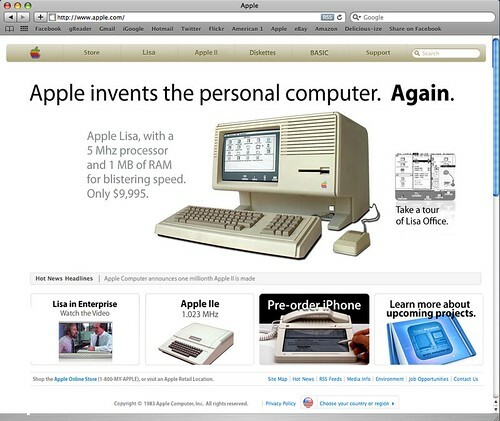 Apple’s first attempt at a next-generation product that could re-establish the company’s pre-eminence was the Lisa. A $10,000 computer designed for the business market, it was a flop. Steve Jobs gives a keynote that warns of the danger of IBM’s dominance. A former soda-pop president named John Sculley comes on board. Apple sells its millionth Apple II computer. And then we all know what happens in 1984. I’m fascinated by how Apple’s web site has changed over the years. And because it has that iconic design, often copied, I thought it’d be cool to use it as a time-traveling template to take a peek into the past. So with some randomly-available product pics and a bit of PhotoShop, I crafted the above Apple.com mockup as it may have appeared in the year 1983. It’s not accurate, of course, because I took some embellishments on the iPhone prototype and the fact that some sort of World Wide Wide existed during the Reagan administration. Whatever. It was me having a bit of fun with some Apple history. What would be cool is if someone took a snapshot of Apple.com as it would appear throughout the years before it’s actual launch in 1996. For instance, I’d love to see what the homepage would’ve looked like on the Newton’s launch day, or the first PowerBook, or System 7. In the meantime, enjoy what could have been. Posted by davelawrence8 at 5:48 am on June 29th, 2009. 37 comments... » Categories: apple, lowend, random. Tags: apple II, apple.com, internet, iphone, lisa, mac, macintosh, mockup, web. Subscribe via RSS. My roommate has this thing with technology. It freaks him out. Like when my iMac and my iPhone ring with an iCal alarm at the same time, he gets spooked. Sometimes my iMac G3, running OS 9, will wake up in the middle of the night and start talking in some robotic voice. My roommate said he almost tossed the Mac into the pond next to our apartment. But now I’m starting to worry. 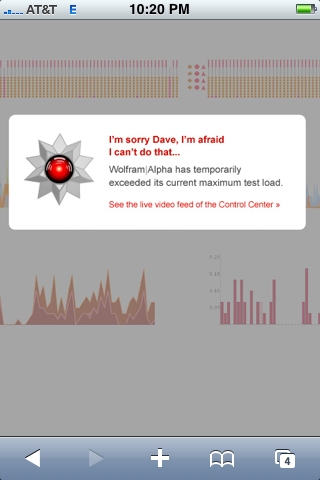 I gave that Wolfram|Alpha thingy a try the other day, on my iPhone, and got the above message. It addressed me personally, and I freaked out a little. Now I know my iPhone has my name in it. And I know that the HAL-like graphic invokes some 2001 reference (“What are you doing, Dave?”). Still. It’s a bit creepy to have your phone address you by your first name. Called it the Uncanny Valley, or call it some robotic defense system that becomes self aware and starts offing humans. Whatever. It’s terrible. And now Adobe products are figuring things out on their own. I dig technology. I’ve devoted this blog to a device that reads my friggin’ handwriting. The Newton is pretty smart. But it doesn’t call me out by name. That’s a step too far. Posted by davelawrence8 at 6:09 am on June 11th, 2009. 5 comments... » Categories: random. Tags: adobe, creepy, iphone, matrix, newton, skynet, uncanny valley, wolfram alpha. Subscribe via RSS. - Steven Frank, from his blog stevenf, on a dream machine/wiki that holds everything he knows. Posted by davelawrence8 at 7:17 am on April 8th, 2009. No comments... » Categories: newton, PDA, random. Tags: evernote, iphone, kindle, messagepad, newton, onenote, steven frank, tumblr, wiki, xanadu. Subscribe via RSS.